Of course I was a member of a union, you had to be in those days. Transport and General Union first of all strangely enough. You were expected to be in a union, just a thing you had to be in. You took things for granted- paid your dues and that was it. 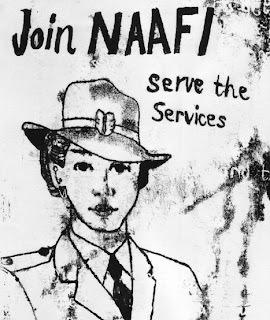 Mary explained: in the NAFFI wore a uniform, blue overalls and to go out in khaki skirt, top and hat, all to match. You got your uniform, it wasn't uncomfortable. 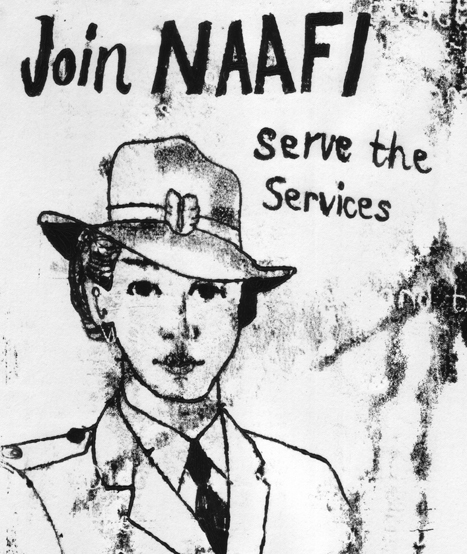 Was a housemaid to start with, then the war started it was either join the Land Army, or the NAFFI, so I joined the NAFFI canteen. I trained as a manageress, to go here there and everywhere. We preferred the army than the air force, the air force thought they were a bit up-perty, a bit of a snob shall we say. Used to start about 10.00am then to 2.00pm, then later on 7.00 till 10.00 we all had different hours. Only thing we didn’t like was getting up at 6.00am, because we couldn’t do anything… But when they started blowing the bagpipes and the horns it would echo in the Nissan Huts. That’s when I met my husband, in the H.L.I, (Highland Light Infantry) up in Northumbria. The Sergeant Major would go round with his big stick and flip the kilts up, check they had the right gear on. (our windows where to high to have a look!) If not, got JANKERS… do extra duties, the main one working in the NAFFI doing all the washing up. Food we gave them depended on the day, hot dogs and cakes one day, and sandwiches. Mostly cigarettes they went for, they weren’t rationed there. What exactly is a kitchenette?